Lavender Manor Guest Lodge in Hermanus is an owner managed luxury guest house in Hermanus, the heart of the picturesque Cape Whale Coast near Cape Town. Hermanus accommodation at its finest, Lavender Manor offers stunning sea view accommodation and warm, relaxed hospitality that you can afford. Overlooking famous Blue Flag Grotto Beach and the whale sanctuary of Walker Bay, you are within two minutes walk of the various magnificent beaches in the area as well as the famous scenic cliff path. Relax in the cosy pool area, enjoy a refreshing drink at the fully licensed sea view pub, and watch the magical whales and the incredible sunsets over the Atlantic ocean from the upstairs patios and sundowner decks. An affordable, 4 star luxury guest house at its best! Stunning whale watching. Lie in your bed and watch the whales ! Luxurious, uniquely decorated bedrooms/suites with full en-suite bathrooms and all luxuries. Two minutes walk to Grotto Beach, the cliff-path and various mountain trails in Fernkloof. Situated in quiet, safe and peaceful Voëlklip just outside the busy town centre. Whale watching & sundowner patios with superb sea and mountain views. Ideally positioned to explore all the great attractions of the Cape Whale Coast. Large upstairs lounge with fireplace, fully licensed sea view bar and panoramic sea views. Close to the Hemel-en-Aarde wine route and suberb golf courses. Mountain, Beach and sea view guest house accommodation at its absolute best. 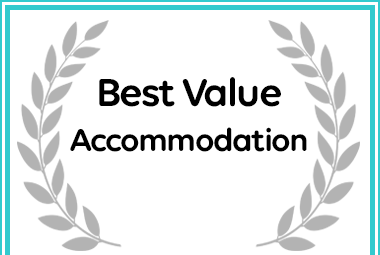 Lavender Manor has received a Best Value Award for Accommodation in Voelklip.